Spring cleaning is a heck of a big deal, won’t you say? With all the planning, organizing and decluttering you have to do it is easy to get scared. As professional cleaners, we know that what you need is a little guidance and some spring cleaning tips. Once you have it organized and figured out it gets quite easy and even fun. There is a way to not get intimidated by the work before you. Divide and conquer, we say. Room by room, corner after corner, you can clear out the entire house. Why not start by cleaning the kitchen? It is probably the place that gets the most stubborn grime and clutter. And once it gets cleaned it will be a real joy to cook in it and invite guests for dinner. It’s time to tackle the harder tasks. Harder doesn’t mean impossible, though. At least that’s what our move out cleaners say. 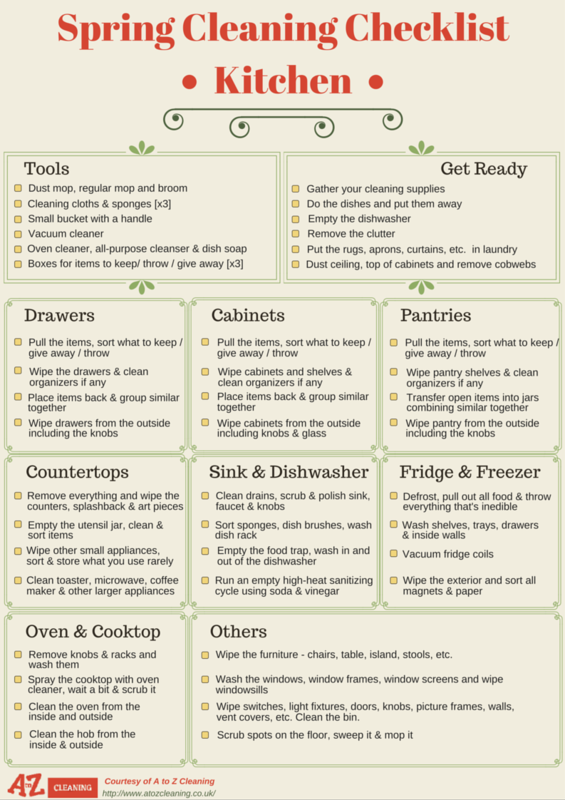 Here we have a complete spring cleaning checklist containing everything you need for a good kitchen cleaning. Print it and go through it step-by-step. 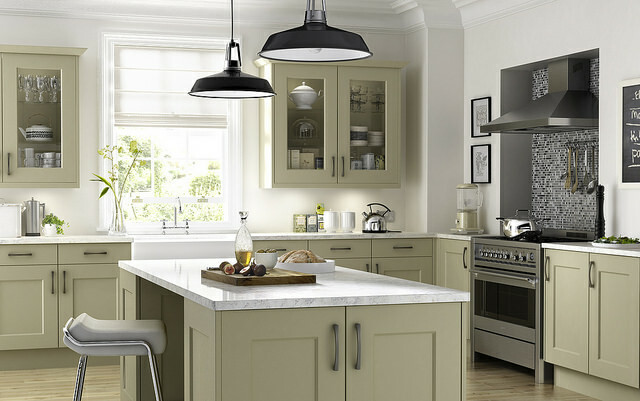 While you’re cleaning, you’ll see that spring cleaning the kitchen isn’t that hard when it’s broken down into small bits and pieces. Each task is quite easy. You just need a pleasant music in the background, a cup of coffee or tea to sip from every now and then, and our checklist. Before you dive in the piles of clutter, holding a sponge, ready to fight all stubborn grease, we have some guides for you. Keeping these spring cleaning tips in mind will help you do the maximum for the time you have. Use proven detergents – this is not the time to test that new DIY recipe you have found on Pinterest. Spring cleaning is time-consuming as it is, so you want to avoid any setbacks. Stay focused – you are cleaning the kitchen and the kitchen only. Do not get distracted by other tasks. Get help if needed – depending on the size of the kitchen and its condition, you may need a helping hand. You can hire local cleaners like the Fulham ones or call a friend – whatever suits you most. Get rid of all unwanted items – sort out the things that you use and the ones you don’t, and get rid of the last ones. You can donate or give them to friends and family. You can even sell some of the stuff you have. Keep the kids away – it will be the best if you call a nanny or a relative to pick them up for the day. Children demand attention and that is a thing you need to save for the task at hand – cleaning the kitchen. Use a spring cleaning checklist – just to keep on track with all the cleaning. Spring cleaning checklists are great and all but sometimes questions may arise. So we’ve prepared some spring cleaning tips to refer to when you need. Drawers, cabinets and pantries – when clearing them out it’s important to sort the things that you use often from the things that aren’t that important. Especially if you are a hoarder and suffer from it. Consider donating or giving away to friends everything that isn’t important. Yes, that tea set you got five years ago for Christmas but haven’t used ever since, needs to go as well. When putting the items back, make sure to group similar together and when you’re organizing the pantry you can put stuff into categories such as “condiments” and “for baking”. Sink and dishwasher – a common mistake is leaving harsh detergents to work for too long. Make sure to read the instructions before using the cleaning products and definitely don’t wait for more that ten minutes to rinse them off. If you do, you risk ruining your appliances for good as some detergents induce chemical reactions when in contact with certain materials such as metal. Fridge and freezer – you need to unplug them at least 24 hours prior to cleaning if you want them to fully defrost. Cleaning the fridge and freezer is a great opportunity to organize the food the way you want to. 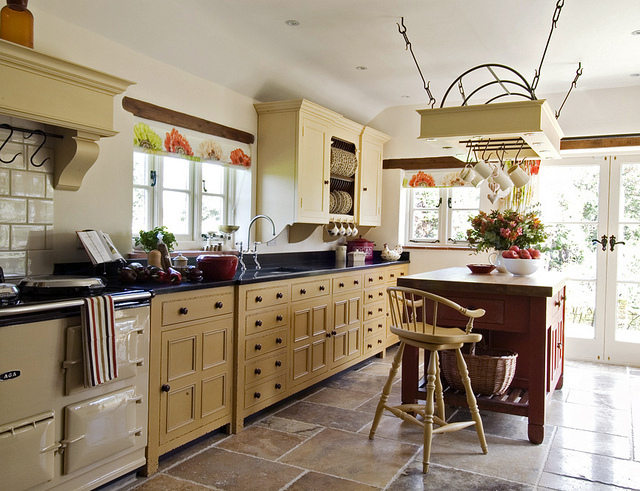 Oven and cooktop – the hardest things to clean in the kitchen. You will have to soak all removable parts in hot water and detergent to remove the stubborn grease. Spraying the appliance with an oven cleaner and letting it work its magic for a few minutes will help you clean it easily. But be careful with it and don’t leave it for too long. Now that you’re done with spring cleaning the kitchen it’s time to create delicious meals once again. Starting tomorrow, of course. Food the evening, you can just order in some food and enjoy your clean and fresh kitchen.